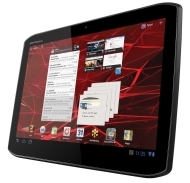 alaTest has collected and analyzed 654 reviews of Motorola XOOM 2 MZ615 / Motorola XYBOARD 10.1 WiFi MZ615. The average rating for this product is 4.2/5, compared to an average rating of 4.5/5 for other products in the same category for all reviews. People are impressed by the portability and screen. The price and performance are also mentioned favorably, whereas the GPS navigation and storage get critical comments. Comments are divided on the reliability. We analyzed user and expert ratings, product age and more factors. Compared to other products in the same category the Motorola XOOM 2 MZ615 / Motorola XYBOARD 10.1 WiFi MZ615 is awarded an overall alaScore™ of 89/100 = Very good quality. The Motorola Xoom 2 improves on the original in almost every way. However, it's no longer the only Honeycomb tablet out there, and pricing seems far too optimistic. Elegant Evolution. The successor to the Xoom is here: the Xoom 2. The competition in the tablet segment is high: Apple's iPads as well as other Android tablets, such as, the Acer Iconia Tab A500 or the Samsung Galaxy Tab 10.1. A capable tablet that is held back by aging software. Yes, Angry Birds is present, but that’s only going to carry the Android Market so far. This Android tablet may be smaller than most but it's also better.